Four ways YOU can share in the SFI growth – One of the reasons why SFI is so successful is because it’s so easy to get started. You will immediately earn two Co-Sponsored Affiliates and then two more each month you retain your EA rank. As an affiliate’s Co-Sponsor, you’ll earn 15% CV commissions on all their purchases every month! But don’t stop there! Every month, thousands of Co-Sponsored Affiliates are forfeited and need a NEW co-sponsor. Become a Team Leader and a share of all of these forfeited Co-Sponsored Affiliates will be automatically added to your team, with YOU as their new co-sponsor! You’ll receive one share as a Bronze Team Leader, two shares as a Silver Team Leader, three shares as a Gold Team Leader, or four shares as a Platinum Team Leader. 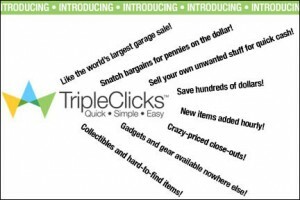 Now featuring more than 64,000 products from over 100 countries worldwide, TripleClicks is one of the fastest-growing e-commerce Websites in the world. Every month, we put a whopping 40% of the Commission Volume of EVERY order – company-wide – into a pool of tens of thousands of dollars for our affiliates to share in! We call it the TripleClicks Executive Pool. Just become an Executive Affiliate (EA) with 1,500 VP, and you’ll immediately qualify for shares of the pool. Earn one share of the pool for each VersaPoint you score for the month! Use SFI’s S-Builder Co-op, a program that generates HUNDREDS of new SFI Affiliates and TripleClicks members and awards them to participating affiliates. Get SFI affiliates from the Master Trainers Co-op and use your SFI Co-op Manager to help you position these affiliates with guidance from your Genealogy Information. Locate 5 to 10 serious business builders and guide them to use these four duplicable ways to share in the SFI growth. Get CSAs (Co-Sponsor Affiliates): add monthly 15% commissions and matching VersaPoints too. Refer ECAs (E-Commerce Associates) to TripleClicks: earn upfront VersaPoints and lucrative cash royalties for life! Simply refer companies that sell products to your ECA Gateway.For each that becomes an approved ECA, you can earn VP and 10% of the CV on all of their sales at TripleClicks – for life! Plus, you’ll earn an immediate 100 VP when your ECA lists their first product. Use SFIPPA (SFI’s Pay-Per-Action) Program: SFIPPA allows you to act as an advertiser for SFI and earn supplemental income by getting others to take actions such as filling out forms. Earn up to $11 per action (CPA).